When A TV Character Vanishes From A Series Without Mention, They’ve Fallen Victim To? There are many reasons for a character to leave a show, and quite a few ways for showrunners to work that character out of the story in a way that maintains a sort of plausibility. Sometimes, if an actress is pregnant in real life, for example, she may go missing in the show for a period of time. When Gillian Anderson, best known for her role as Agent Scully on the X-Files, was pregnant during filming, she was abducted and MIA until the pregnancy was over. Other times, actors leave because of conflicts with the rest of the cast, or schedule conflicts with the filming of the show itself. In such cases, the character is, depending on the nature of the show, killed off, put on a bus (moved away), or replaced with a new actor. In the worst case scenario, because it provides absolutely no closure at all to viewers, a character may fall victim to what’s called Chuck Cunningham Syndrome. The term is named after the older brother of Happy Days character Richie Cunningham. Chuck was on the show for two seasons and then, after heading upstairs in a particular episode, never mentioned again in the show. A similar fate befell the youngest Winslow daughter Judy on the show Family Matters—she also went upstairs one episode and simply never returned. Clearly, sitcom staircases are dangerous territory for second string characters. Given how often, over the years, a character vanishes from a TV show with no good explanation, why name the trope after Chuck Cunningham? Not only does the age of Happy Days help (in that it was an early example of the phenomenon), but viewers got a peculiar reminder of Chuck’s disappearance nearly every year, which further cemented how bizarre it was that he was gone but never mentioned. The episode Chuck vanishes in was the Christmas special episode from the end of the second season that was particularly popular because it involved the Fonz spending the holidays with the Cunningham family. Because the episode was so popular, ABC re-ran the episode around Christmas for years and years after the initial air date. 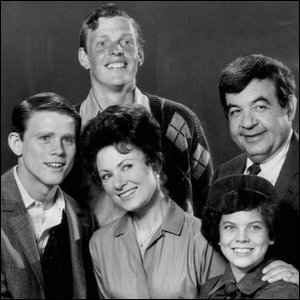 Given that Happy Days was on the air for nine years after Chuck Cunningham vanished from the show, yet for many years afterwards viewers got a Christmas reminder that he was gone, his absence became a running joke and a shoo-in for the name of this trope.